Twenty-seven years ago today (November 15, 1990), President George H.W. 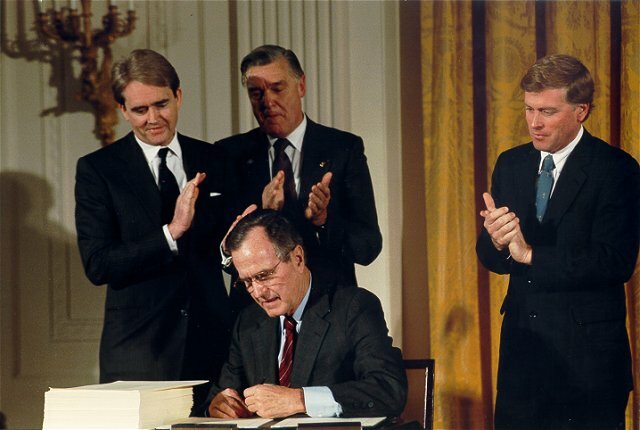 Bush, backed by a supermajority of Congress, improved the Clean Air Act. The new law was one of the most significant steps the nation has ever taken to protect public health and the environment. Looking back on it today, we can clearly see that when our leaders work together across party lines to cut pollution and protect public health, we all win. The 1990 amendments to the Clean Air Act were designed to curb four major threats to both the environment and the health of millions of Americans: acid rain, urban smog, toxic air pollution and the hole in the Earth’s ozone layer. 27 years later, we have made massive progress on all four fronts. The law has significantly improved air quality in our nation’s cities and towns. Since 1990, carbon monoxide pollution is down more than 75 percent. Nitrogen dioxide levels are down by more than half. Particulate pollution levels are down by more than 40 percent. As a result, we are living longer and healthier lives — and we can better appreciate clearer views in many cities and national parks. We have also greatly reduced toxic air pollution from factories and vehicles. Emissions of toxic chemicals such as benzene and mercury have declined by more than two-thirds and lead levels in outdoor air are down more than 99 percent. That means less cancer and fewer risks to our neurological and reproductive health. Our lakes, rivers and forests are less burdened by acid rain. One of the main causes of acid rain — sulfur dioxide pollution from power plants — has declined more than 80 percent since 1990, and is continuing to fall. At the same time, we’re making real progress in healing the Earth’s ozone layer. NASA announced this year that the ozone hole has shrunk to the smallest level recorded since 1998 — protecting millions of people from solar radiation that can cause skin cancers and cataracts. However, despite the massive progress we have made since the Clean Air Act was improved in 1990, there’s still a long way to go. Smog and particulate pollution still persist in many areas of the country. The American Lung Association, in its State of the Air 2017 report, concluded that four in 10 Americans still have unhealthy levels of air pollution in their communities. And as we’re learning more about the dangers of air pollution, scientists are finding there’s no safe level of exposure, so we need to keep tightening standards. And we are facing an even more serious air pollution problem — climate change. Not only is climate change making air pollution worse (Exhibit A: this summer’s terrible fire season and heat waves), but it poses its own far-reaching threats to our health and well-being and the future of communities across the nation. Already, global warming pollution is acidifying the ocean, driving extreme storms, fueling drought and floods and causing the oceans to rise. These changes pose serious threats to our safety, our homes and businesses, our food and water supplies, and the natural ecosystems upon which we depend. Tackling these persistent and difficult problems will take more work and more leadership. That leadership must come from civic leaders at all levels of government — and across every political party. Pres. George H.W. Bush negotiated the landmark climate treaty that underpins the Paris Climate Agreement — the United Nations Framework Convention on Climate Change — in 1992. The president said at the time that the United States “fully intends to be the world’s preeminent leader in protecting the global environment.” The Senate then ratified the treaty, which. Sen. McConnell called “a fine agreement,” according to The Hill. However, the spirit of practical cooperation does live on today — especially at the state and local level. For example, right now, five Republican and four Democratic governors in the Northeast and Mid-Atlantic states are finalizing a plan to cut carbon pollution from power plants by at least two-thirds below 2005 levels by 2030, through the Regional Greenhouse Gas Initiative. This plan is just one of many efforts that states, local governments and businesseshave launched to cut pollution and deliver on the pledge that America made to cooperate with other nations through the Paris Climate Agreement. All together, these allies represent more than half of the United States economy and population — proving that we can still make progress even if the federal government willfully looks the wrong way. Ultimately, though, we’re going to need federal leaders back on board. We’re all in this together, and we’re going to need to act together. Let’s look back to 1990 and the strengthening of the Clean Air Act for an example of how we can get the job done.